The Stripes shower curtain is designed and produced by well-known German brand Kleine Wolke, established in 1968, and is backed by their quality guarantee. A luxury, quick dry and easy care polyester fabric, as used in many high end hotels. 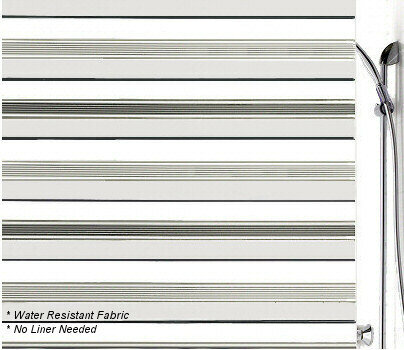 This luxury shower curtain has unique horizontal stripes, something we have not seen very often in a shower curtain design. The flowing polyester material is elegant and the weighted bottom hem makes this a practical shower curtain for any space. Grey : Black and medium grey stripes with larger light grey stripes on a white background.